As I posted here, I have decided to focus on my 32 3rd great grandparents as my research focus for 2013. I decided to start with the ancestor that I knew the least about and in a quick browsing of the list I stopped immediately at Elizabeth Beard. I am related to Elizabeth through my paternal grandmother, Lois Burnett. As I looked through my files I realized that I have absolutely no information on Elizabeth Beard or the Beard line. 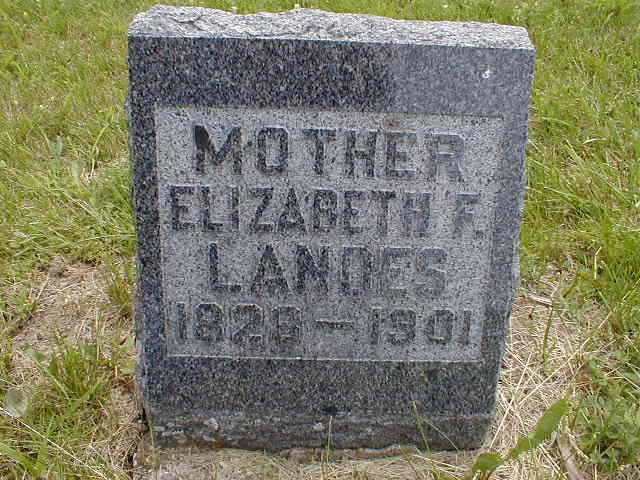 The only information I have comes from her daughter's, Martha Ellen Landis (or Landes), death certificate. It notes that Elizabeth's maiden name was Beard and that she was born in Staunton, Augusta County, Virigina. But that is where the leads stop. I looked for Elizabeth in the 1850 census, but there are several families of Beards in Augusta County and Elizabeth was a popular name. I haven't been able to link her to any particular family. I did find Virginia marriage records for two of her daughters and found that her middle initial was F. It possibly stood for Frances. A genealogy submitted to the FamilySearch website lists her parents as Abraham Beard and Mary King. I do know that Elizabeth and Samuel moved to Johnson County, Missouri sometime between 1870 and 1880. At least two of their married daughters and their families moved along with them. By 1900, Elizabeth was widowed and living with her daughter. She died in 1901 and is buried next to her husband in the Kingsville Cemetery, Kingsville, Missouri. I've posted queries on both the Beard surname and the Augusta county, VA message boards in the hopes that I get a hit. So I'm off and running on my goals! For someone who doesn't know anything, you're off to a great start! HA! Even though there are a number of Elizabeth Beards in Augusta County, you have the clue that at least ONE person believes her father was Abraham. It'll be fun to verify that information. What a great resolution and research goal! Can't wait to follow your adventure as you sort through those 3rd greats :). I guess you are right, Wendy, I do know quite a lot! I agree that working backwards may pan out. I'm hoping that I get some hits on the messages boards, too. Thanks for stopping by! Thanks, Sarah! Only 31 left to explore. Thanks for stopping by!